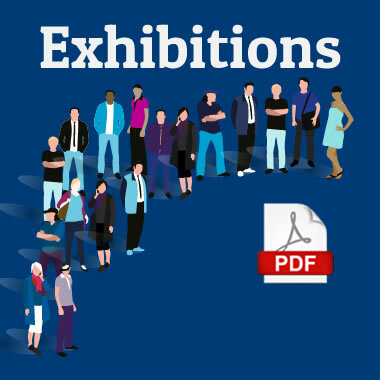 VenuIQ could be used in the following ways by your exhibition venue or in partnership with your exhibition or conference organiser. Create your own app using our off-the-shelf packages with all the information your visitor might need including speaker profiles, calendar, chat, social, programme information and ticketing. 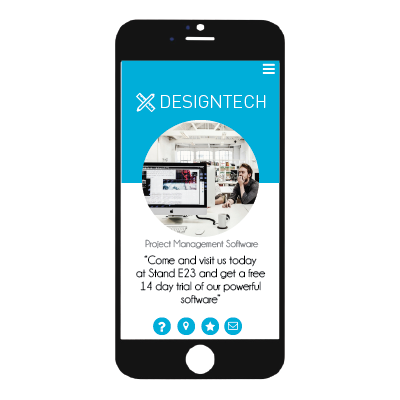 Or go fully bespoke and design an app exactly branded to your specific needs and requirements. 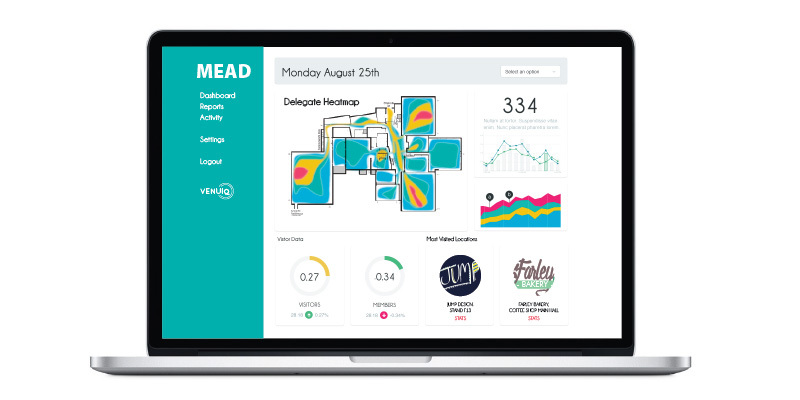 Don’t be limited by our suggestions though, anything you can think of based on location, your internal systems and customer interaction can be built and included into your venue app. Get in touch now to discuss your requirements. 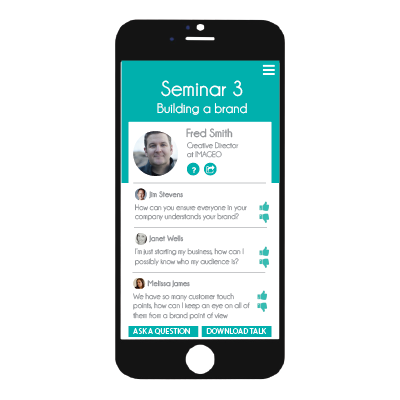 Using the app, you could arrange to have the audience ask your key speakers questions live during their speech. Guests could also vote up questions from a list of all asked questions and thus the most most popular questions will be asked of the speaker. when question and answer time arrives, only the key questions would be put to the speaker. Find out more about the speaker during the seminar by clicking in the app on their biography. send requests for more information or have the entire speech, presentation and notes downloaded to your phone or email address for viewing during the event or later. 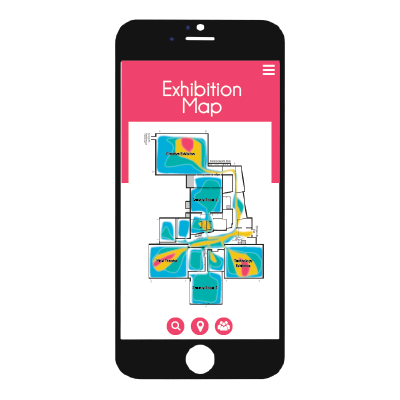 Utilising the in-app heat map information, visitors to your exhibition will be able to see what are the most popular booths or where a bottleneck is occuring and they can scoot around it. Further enhance Sponsors ROI by pushing content live or at specific times to users to publicise key-note sessions or special offers and services. While walking around the stands, the iBeacons trigger the app to showcase an exhibitors key products or services. Visitors can choose to click more information or sign up to a mailing list if they’re interested or choose to have a brochure sent to their business address. Attendees can save their favourite stands and check on the information back at home without having to remember the names of who they’ve seen. Exhibitors get better leads from people that actually visit their stand rather than the entire database of all attendees. Alert guests to vital information occurring during the show. rather than just give your visitors a timetable for the day, they can have a bespoke agenda made for them so they only have to be alerted to the items that matter. alerts for key speakers, meeting times at exhibitor stands, and train times could be sent to the app to keep the visitor up to date. Don’t just guess how many people came to the exhibition, now you’ll know! People trails and heat maps reveal which stands people visited, what areas of the exhibition are the most popular with your audience and how long people lingered at a particular spot. From this you’ll know where to place your seminars, coffee areas, price your better stand space higher (and have proof for doing it). 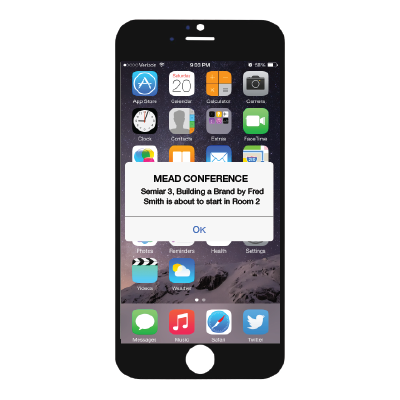 Wondering how you can incorporate beacons and the VenuIQ software into your next exhibition or conference? We’d love to help you and your venue out with a bespoke app that works exactly how you want it to.